People go to Yelp for reviews, but also for phone numbers, addresses, and hours. Facebook wants that traffic, so today it rolled out a global redesign of mobile Pages that features details about local businesses, star ratings, and buttons to Like, Call, or Check-In to them up top. Facebook tells me this is its first “truly mobile-first” redesign, with no immediately scheduled parallel web makeover. The focuses on mobile and local make sense considering almost half of Facebook’s business, organization and public-figure Page visits now come from mobile, and Facebook now hosts 15 million local business Pages in addition to brand Pages. The redesign is visible as of today on Facebook’s mobile site and the latest version (6.0+) of Facebook for iOS, and will come to its flagship Android app in early May. Facebook has been previewing a version of the new look for Pages within its recently launched Nearby local business search mobile feature. Facebook tells me it plans to take learnings from the mobile redesign and see how it can apply them to improve its web layout. In an interesting coincidence, Foursquare just redesigned its web venue pages to focus on discovery, while Facebook here overhauled it to feature actionable information. Before we get into the business impact, let’s break down what specifically has changed. Here we’ll look at a Page for the restaurant Woodhouse Fish Co., as the redesign’s changes are more pronounced for local businesses than corporate brand Pages (we show CNN’s Page farther below). The old design was more spread out and filled with tiles representing content rather than the content itself. Relatively low-signal counts of Likes, people talking about, and check-ins were shown at the top, and the profile picture was only half overlaid on the cover. Price range, business category, and address were shown in tiny font, while photos and the map were buried in tiles you had to expand. There was no immediately visible average star rating, and recommendations were pushed far down the feed. The recommendations bar sometimes showed tips from strangers rather than friends first. The new design focuses on immediately surfacing useful information without the need for extra taps. Buttons to Like, Check-In, Call, and More (Share, Message, Copy Link, Report) are now right at the top. It feels like a better use of space than the empty-seeming old action buttons. Next, a zoomed-in map (by Google in iOS) is shown so you immediately can identify the cross streets and general location, with the address, distance, hours, and price range just below it. Then there’s a big average star rating, and reviews from your friends. Beyond those are a big button to add your own recommendation, a near full-screen sideways-swipable album of photos from the place, and then finally the feed of Timeline posts. One element minimized in the new design is a Write Post button. Facebook seems to feel that random posts to a business’ wall aren’t that helpful to anyone. It’d much prefer you give a recommendation and a star rating — structured data it can use more effectively to promote or demote the Page in Graph Search and Nearby listings, and show someone if they’d actually want to visit. Facebook’s mobile Pages now look conspicuously similar to those in Yelp’s iOS app, which also feature action buttons, details, and a map at the top. For brand Pages, Facebook highlights “Message” and “Share” buttons at the top that encourage people to communicate privately with a Page or help friends discover it. There’s also a new layout for corporate Pages like Nordstrom which have both a central brand Page and many local business Pages. 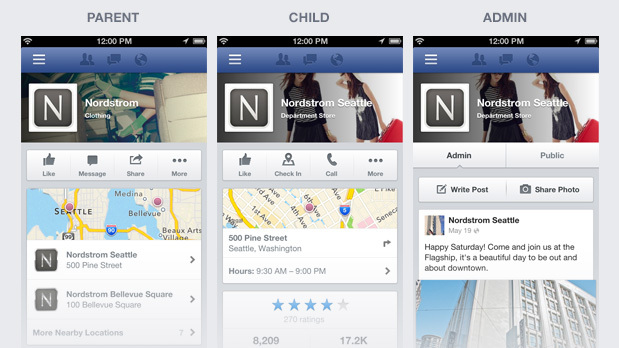 The parent/brand page now shows links to its child/local Pages below the map so you can find the nearest location. Along with the design changes come new options for Page owners, though they don’t have to do anything to activate the redesign. They can now pin a post near the top of their Page, similar to desktop. They can also easily switch back between the admin and user view of their business, which can help them see their Page through the public’s eyes, or comment on posts with their personal account. Until now, the focus of Facebook Pages has been their social component. While that community feel was unique, most people weren’t visiting Pages to join messy comment threads. On the desktop, they’d often be looking for content, so Facebook keeps the Timeline prominent. But on mobile, Facebook seems to have found people want actionable information so they can make decisions on the go. That’s why it implemented this redesign. It meshes perfectly with emergence of Facebook as a local business search competitor to Yelp, Google Places, and offline Yellow Pages, and disorganized company websites. In December Facebook launched Nearby, a mobile local business search feature that lets you browse businesses of different categories close by that are ranked by Likes, check-ins, ratings, and where your friends go. Then in January it launched Graph Search on the web, which includes local business search. Both rely on structured data from users to improve rankings. This mobile Pages redesign is centered around both sucking in and revealing that structured data. By making the Like, Check-in, and Recommend buttons more prominent, Facebook is sure to inspire more of those actions. The social network has a long, long way to go before it can match the review collections of Yelp or Google’s Zagat, but this redesign should help it get on its way. If it can score local search traffic, Facebook will score the opportunity for monetization by luring businesses to pay for ads. Facebook doesn’t show query keyword-related Graph Search ads or any ads in Nearby just yet, but those are expected to come and this redesign would make them more valuable. Facebook Pages are now better designed to get someone in a local business’ door. If Facebook can marry the utility of business details found elsewhere with a unique layer of trusted recommendations from your friends, and let you interact with a business all in one place, it could start convincing people to open Facebook rather than Yelp or their search bar when they want to know where to go.